Currently there are various beneficial biogas utilization options available with the advancement of the technologies. Biogas can be used in many applications as an alternative to fossil fuel. The most common uses for biogas are electricity production and heat generation. But with the new and emerging biogas upgrading technologies, it can be converted to renewable natural gas and compressed renewable natural gas as well to be used as vehicle fuels. In addition, the versatile uses of biogas allow facilities to provide multiple end-uses at the same location; thus allow biogas to play a larger role in the renewable energy sector. Electricity and heat are still the most convenient application for many biogas plants. Most biogas-to-electricity producing plants usually use the waste heat from the IC engine/ micro-turbine to heat the digester. Beneficial use of the heat produced during electricity generation is called combined heat and power generation or cogeneration, and this increases the overall energy efficiency of the systems. Recently, the advancement in technology has created other beneficial usage of biogas and that is to produce renewable natural gas (RNG) and compressed renewable natural gas. The renewable natural gas can be injected to existing gas grid to be utilized in various residential commercial and industrial usages. RNG must meet some specific minimum or maximum levels for certain gases, moisture, and other constituents in order to be added into the existing gas grid and it must be pressurized before injection. But once RNG is added to the pipeline it is considered to be no different from natural gas. In addition, RNG can be compressed to be used as a transportation fuel. Compressed RNG can also be stored in pressurized containers to be used on-site or at remote locations. Compressed RNG can also be taken to vehicle fuelling stations using trailer-mounted pressurized containers. Depending on the end use, different biogas cleaning and upgrading steps are necessary. For example, when it is intended to use as a vehicle fuel or grid injection, the gas needs to be upgraded to increase its energy value. Although upgrading adds extra cost to the biogas production, the main advantage of upgrading is that; it can be used as an alternative to natural gas. This helps replacing the fossil fuel and reducing the green house gas emission at the same time. 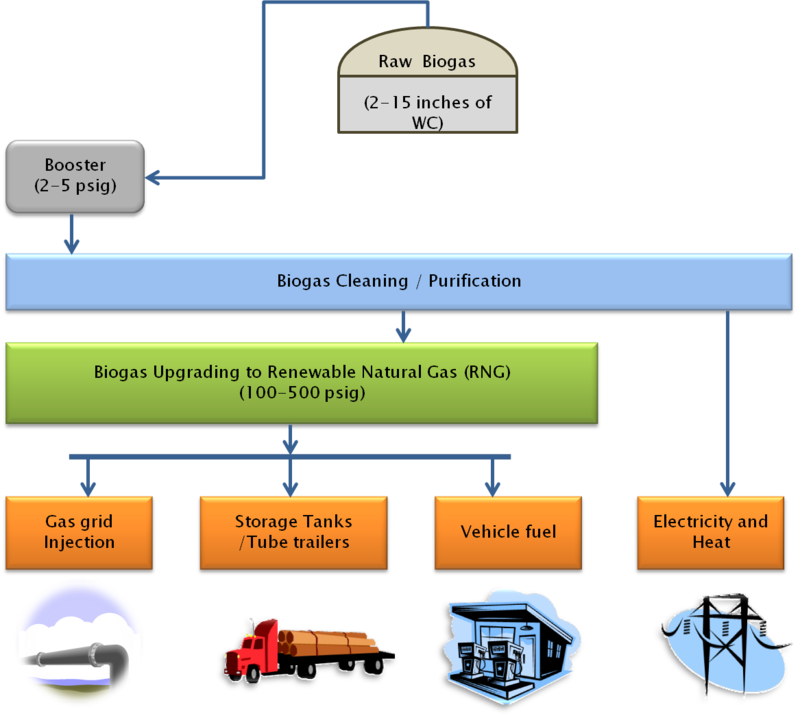 Some Beneficial End Use of Biogas along with their Cleaning and Upgrading Requirements. Discover more on Biogas and Anaerobic Digestion!